OEM Manufacturer of a wide range of products which include cold stacking machine. Cold Stacking Machine is widely using for automotive and polymer material assembly process by two different parts(metal with a plastic,plastic with metal and plastic to plastic).by this operation during material fusing or stacking no heating power is required and appearance of the material not damaged. The above machine is using for Mahindra vehicles part assembly.we have standard as well as tailor made machine also available. 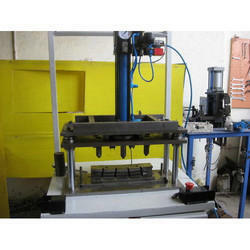 Looking for Stacking Machine ?